To verify your e-mail software is properly integrated follow the steps here. 1. To see where your contacts are being saved first ensure your email software is connected to LeadQuizzes. To do this select Integrations from the tool bar on the left hand side. Next, select the email software to confirm the information necessary to connect. 2. 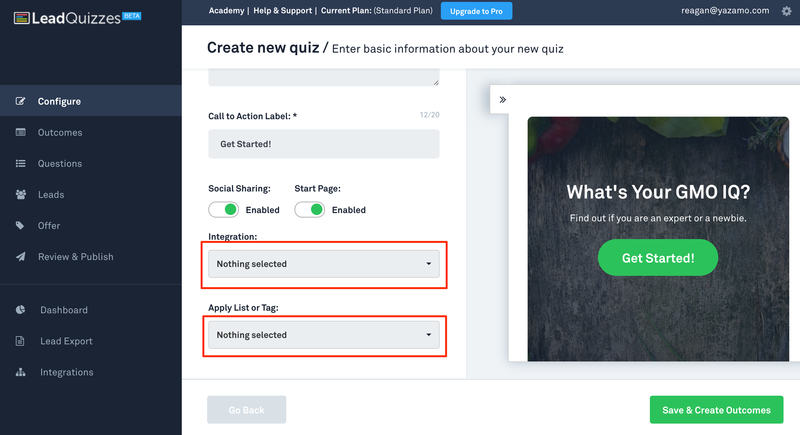 Go to the quiz you created and make sure that you have your integration selected as well as the list or tag you would like the leads to go to. This tells LeadQuizzes where to store that information in your email software. 3. Complete your quiz and enter your own information into the quiz to receive your results and send the information to your email software. 4. Next log into your email software and search for your email address to ensure it was added to the correct place as you outlined in LeadQuizzes.